How can I get that 2 second window of time to think before I act? Many people know that it is crucial to take a Time Out before major bad things are said or done, but when that time comes in a passionate exchange with their partner, they seem absolutely incapable of stopping themselves. When adrenaline runs high in your body, you’ll find that even though you have sworn in the past to take time outs, that you simply had to have that last zinger, question or comment. Well oops, that was the proverbial last straw that broke all hell loose! The trick it seems is to recognize when your amygdala-pituitary-hippocampal-adrenal glands are beginning to ramp up. And, you can do that without a crystal ball, a Ph.D. or an M.D. degree. It just takes a little re-engineering of where you direct your attention. Even though you’re thinking, “How could he be so uncaring about how I feel?” Or, “Why is she ruining a perfectly good evening?”, you could be redirecting your attention to your physiology, your own thinking and your own thinking. 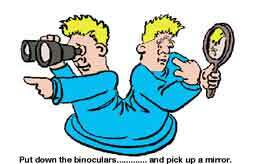 You can put down the binoculars looking at your partner’s thoughts, feelings and behaviors and pick up a mirror to become aware of your own thoughts, feelings, behaviors and physiology. Breathing and heart rate changes. Feeling electricity in my head or body. Flushed or hot face. Dry mouth. Headache. Feeling frozen or numb, confused, head spinning, head fog and funnel vision. Pacing, waving hands, raising voice, leaning toward partner, pounding table or wall. Imagining how I can best lie or hurt my partner. Thinking about saying how my partner started this, or how he or she does it worse than me. Feeling like a victim and that I am innocent of what my partner thinks. I’m misunderstood. Nothing short of an absolute surrender of your will to control the situation will allow you to take a Time Out and prevent a lot more damage to the relationship! You will not do this unless you have some experience with the practice of taking a Time Out. I tell couples in my monthly seminar to practice taking Time Outs on small disagreements at least twice in the next month. It’s like a fire drill in that couples get to practice the requirements of the Time Out agreement they made with one another. No one gives up their self-will to manage threatening situations without some level of trust that it will still work out better. If you are willing to see that using your usual style has usually failed, then perhaps you can try something new. For the Time Out to work both partners make the agreement out loud to each other. If you cannot execute the Time Out agreement there are a myriad of possible reasons, some of which I’ll briefly list here: pure selfishness, alcoholism or addiction, mental health disorders such as borderline, narcissism, PTSD (post traumatic stress disorder) bipolar disorder or side effects of medications and chronic lying. For these issues one or both partners should seek professional counseling. Using the five agreements and two skill of the Real Hope Couples Course can help couples navigate these qualities, but getting help individually is most often necessary. I wrote the full Time Out agreement and an exercise for learning how to recognize that it’s time to stop arguing much earlier. It’s free and it’s 9 pages of the pure practical advice for stopping arguments more quickly. Go HERE for this FREE download. I welcome and respond to any comments about the ideas or my methods. I have total acceptance and compassion for myself and others, in this moment… as is.